The following is a guest post from Terra Trevor, who is sharing her journey as part of my new “Stories of Recovery” series. Terra is an essayist, memoirist and nonfiction writer of a widely published diverse body of work. She is also a good bean cook, soup maker, dreamer, and reformed shopper. Visit her weblog where she writes about simple life, the sea, the beach and the joy in becoming more with less, probing life’s complexities. 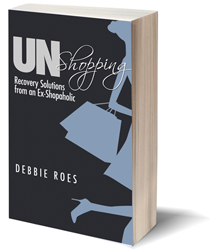 If you would like to be profiled in the “Stories of Recovery” series (you can be anonymous if desired), or if you have an idea for another type of guest post on “Recovering Shopaholic,” please connect with me to share your thoughts. Terra has been able to cultivate a small workable wardrobe. 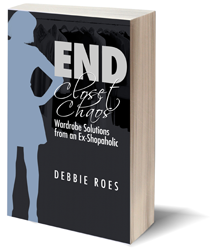 I recently received an email from a reader who is struggling with paring down her overly large wardrobe. She has too many clothes and would like to reduce the volume, but her difficulty lies in the fact that she still likes most of what she has. 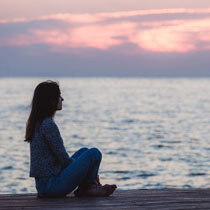 Since I’ve struggled myself with a similar dilemma and I believe many of you can relate to this reader’s challenge, I decided to address her question in a blog post. Is this what your closet looks like? Do you want some help to pare things down? Last week, I finished my abbreviated second round of minimalist clothing challenge Project 333. I’m glad I decided to shorten my Project 333 term from the standard three months to two months this time around, as I was definitely ready to regain access to the rest of my closet. However, I’m also happy that I opted to try dressing with a capsule wardrobe once again. I like challenges and I learned some useful things about myself and my closet through dressing with less for the past two months. In early January, I wrote that I had decided to do another round of the minimalist wardrobe challenge Project 333. Since more than a month has passed since I began my current Project 333 stint, it’s time to share an update on how things are progressing for me. In today’s post, I share my wins and challenges, some of my favorite items and outfits so far, and what I’m learning from dressing with less the second time around. You can learn a lot from challenging yourself to dress with less! I have decided to dip my toe back into the Project 333 pool beginning this month. For those of you who are new to my blog, I took on the Project 333 minimalist wardrobe challenge back in April through June of 2013. I did this in order to cultivate more appreciation for what I had in my closet, as well as to assist me in further paring down my wardrobe. I also hoped to spend less time thinking about what I wore and shopping for new clothing. I achieved those benefits and more (see “My Top 8 Lessons from Project 333”) and hope to learn and grow even more the second time around! As much of the world moves into the frenetic shopping blitz of the holiday season, I’d like to talk about a different type of shopping, the “shopping” we can do in our own closets. I first heard the term “shop your closet” a few years ago on a fashion forum and I have to admit that it didn’t sound like much fun to me at the time. As a dyed-in-the-wool shopaholic, I believed the only shopping I could enjoy was the type that took place in malls or on e-commerce sites. I was always looking for what was new and better than what I already had. Have you taken the time to shop your own closet? As human beings, we can sometimes be walking contradictions. We often say one thing and act in a completely opposite manner. This is definitely true for me in terms of minimalism and simplicity. I say I want a simpler and less complicated life, yet my past “maximalism” still hasn’t been completely exorcised from my psyche. Do you struggle with the less vs. more dichotomy?